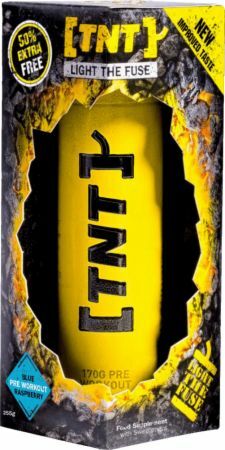 TNT Supplements Light The Fuse at Bodybuilding.com - Best Prices on Light The Fuse! For a limited time, buy 1 Light The Fuse, 30 Servings, & get 1 FREE! 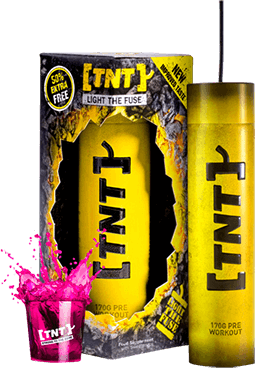 TNT Light The Fuse is the most potent, scientifically formulated pre-workout imaginable. Take one serving (8.5g - one scoop) mixed with 200ml of water 30 minutes before training. If well tolerated, a double dose (17g) can be used by filling the lid level. This is for seasoned pre workout users only and not advised for novice users. It is recommended that you drink plenty of water during your workout. Defiantly better than the first tin i bought, The powder is now free flowing and not clumpy and the new improved taste is spot on plus i got 10 servings free which was a nice bonus from bb.com, cant wait to try another flavour now!! Had this a free sample with last purchase, indeed the work out was enhanced but wouldn’t be buying this not worth the price tag. Last few sessions haven’t taken a pre work out and when his was taken slight strength and endurance was gained, but nothing that would make me go buy it.. didn’t give me a caffeine rush so bonus there. Creade from RSP had used for years but sadly discontinued. Flava was not really that great either but ok.
By far one of the worst pre workouts I’ve used. The packaging/container is terrible as well, scoop way too short for the small cylinder it’s in, it all clogged together and went lumpy from the second I used it. Had to use double serving just to remotely feel anything. Waste of money!! Love this stuff Give me great focus and unreal pumps in the gym. I even use it before cardio if I'm really tired. 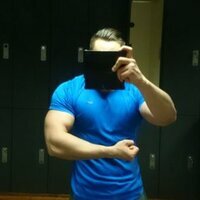 I was amazed by just how powerful this supplement is. Gave me insane pumps, serious focus and most importantly NO CRASH!! The Cranberry & Lime flavour is sooooo nice. I could happily drink it all day if it was a BCAA. I look forward to trying the Blue Raspberry next as Ive heard great things. Comes in metal tube as seen in pictures however powder was compacted into tube and not powder, more like a hard lump. The container did come with a desiccant which should prevent the powder clogging together. I had to poke a knife into the container and cut large chunks of powder out into a shaker as the scoop provided is useless, this was a hassle as you could imagine. However the large chunks did mix and the shake was not lumpy. All I experienced was a face and back tingle but no real difference in pumps or motivation. High Intensity, No Crash, Smooth Focus throughout! I received this product from a Bodypower Expo, and decided to give it a shot. Having tried plenty of preworkouts and feeling a tolerance built up against them, I was amazed how sharp[ly the effects had kicked in. 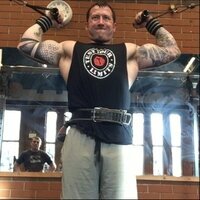 I was extremely focused trhoughout my workout, was lifting new record weight, and had an intensity I haven't felt in years! The stim comedown is about an hour, with the focus staying around for another 10. This proved to be very useful for a morning or lunch workout, with the remaining focus greatly assisting a highly efficient work day. This workout worked perfectly for my routine. 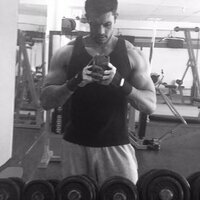 I train late at nights due to work and lifestyle. I can take it 5-10 min before session , and I find it kicks in straight away. I also do not experience any crash after workout or headaches, which I have expletives before with other strong preworkouts. Find it easily last 60-90min in system to get session. Easy to drink, OC tried apple cider and the cranberry & lime. I was a little sceptical about how good this PW could be sometimes stylish packaging can leave you with a poor product but i'm happy to say not in TNT's case this is definitely an explosive product. You get a little tingle from the Beta Alanine (but not to much) then as i trained the pump got more and more intense which i like rather than the stim'd out your brain feeling you get from some of the other pw's it mixed really well and tasted good to not to sweet especially if like me your training first thing in the morning it can be hard to stomach the only negative point id have is it does get a little clumpy and hard to get out the tub especially near the bottom but in fairness i just gave it a few hard shakes and it was good to go. Directions For Light The Fuse: Mix 1.5 scoops of (8.5g) of Light The Fuse® with 200ml of water and consume 30 minutes before training. If well tolerated a triple scoop (17g) can be used. This is for seasoned pre workout users only and NOT advised for novice users. It is recommended that you drink plenty of water throughout your workout. This product is a food supplement and should be used in conjunction with a healthy balanced diet and regular exercise routine. Pregnant or breastfeeding women should consult a doctor or healthcare professional before use. Discontinue use and seek medical advice if you experience any negative side effects. Do not exceed the recommended daily intake. Food supplements should not be used as a substitute for a healthy diet. If you are taking any medication prescribed by your doctor, check with them before taking this product. Store out of the reach of children. Store in a cool dry place. This product is for use by anyone over the age of 18. The packaging and container may be attractive to minors but it should not be used as a toy. Risk of choking due to the presence of small parts. TNT Light The Fuse® Food Supplement with sweeteners 'Contains caffeine. Not recommended for children or pregnant women (Caffeine 125 mg/100ml when mixed as directed). Distributed by TNT Supplements & Nutrition Limited TNT House, New Street, Charfield, GL12 8ES.